On my latest trip to Chiang Mai from Bangkok via the overnight train, I shared a second-class sleeper car with a grouping of Buddhist monks. There were a couple of tourists scattered about, but the majority of the passengers on this car were monks. And, to a man, they all were all chatting away on their cell phones. When they eventually did put down their tiny plastic talkabouts, they filled their now idle mouths with potato chips and candy bars. A couple of young English travelers looked at this ongoing scene with bewilderment, it was as if what was transpiring before their eyes simply did not compute with what they had been conditioned to believe a Buddhist monk would be like. In England, America, and many other Western nations, many spiritual seekers have a very idealistic view of how real Buddhist monks over in the East must be: demure or if comical the comedy must have some transcendent value; eat only rice, vegetables and fruit; and be absorbed in meditation. 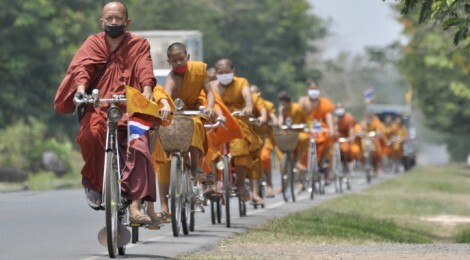 But in reality, Buddhist monks are people. They are sometimes very young or teenage boys, and until they reach supposed nirvana, they will experience cravings. One of these cravings may be talking to friends and family on cell phones while riding the train and another may be eating potato chips and sugary snacks. Which brings me to this: there are two phrases I hear quite often from Western travelers, especially backpackers. The first is, “That isn’t the real Thailand.” And the second with regards to various destinations in Southeast Asia is, “I’ve been there.” To me these two phrases and their deeper ramifications are quite fascinating in that they allow someone to act momentarily as an authority about a subject in which they are truly a neophyte. However, in my years of experience taking notes on the traveling culture that exists throughout the world, it is exactly this lofty ambiguousness that seems to elevate one to “King or Queen of the Nomads” in drunken social settings of boasting and bravado. The first phrase, “That isn’t the real Thailand,” I have heard in response to places like Bangkok and Phuket as well as to examples of unpleasant Thai people and prostitution. But the truth is that Bangkok and Phuket are both real places in Thailand, prostitutes are a part of the culture in Thailand, and yes some Thai people are unfriendly and want only to get hold of the money in your pocket. That may not compute with what the Western mind has been trained to believe about The Land of Smiles, but it is true. But where have they been? And what is real? This is not deep philosophy or ethereal spirituality, but a basic question one must ask oneself in order to not stray into the realm of superficial traveling aficionado. The truth of the matter is that whatever you or I may experience in Thailand, it is simply our experience of our individual consciousness visiting a place that is called and has evolved into, Thailand; because it used to be named Siam. For one middle-aged British man Thailand may be the place where he had sexual relations with as many Thai girls as possible within his two week holiday period; for a Canadian woman Thailand may be visiting every Wat in Chiang Mai; for a group of young Australian travelers it may be staying at cheap guesthouses on Khao San Road; and for an elderly woman from Maine the real Thailand may be working at an orphanage along the Burmese (Myanmar) border teaching English to political refugees. I ask you, which one of these experiences is the most real, and ultimately representational of the true Thailand? During my time in Thailand I have met people who are living out all of the above scenarios, and their individual encounters of Thailand are all very real to them. What I have learned over the course of my fifteen years of nomadic devotion, which includes living, working, and volunteering throughout the world, is that what is real depends upon the reality one is operating within. This psychological space can stay mainly the same for one’s whole adult lifetime or change in the blink of an eye depending on how easily one can let go of their past history and social conditionings to be alive in this present moment. That is why as a writer I have found that it is impossible to summarize a place, because every place is a stream unto itself and that current does not stop when someone either dips their foot into it or totally submerges their self. This is true for local or foreigner alike. Travelers like to think that local people know the secrets of their country. But local people, in every country that I have ever visited or lived in, including my own, may know only the names of the trees in their neck of the woods and could be wholly ignorant of any other part of their homeland. For instance, here in Thailand, when I stayed in an almost exclusively working class Thai neighborhood in Bangkok the locals there told me that Chiang Mai and Chiang Rai were both boring small towns. In Chiang Mai I was told that Bangkok was a big dirty city with unfriendly people and that Chiang Rai was too provincial. In Chiang Rai every local that I met said that there was no real difference between Bangkok and Chiang Mai, they were both big polluted cities full of unfriendly people. The only two things that I found that any of these Thai locals had in common, was that most of them had never left their home city to explore the rest of their country, but yet they all seemed to think that the border town of Mae Hong Son was a beautiful place. What these sedentary Thais and the international Western backpacker scene have in common is their willingness to act as connoisseurs about places that they have either never visited or spent a very short amount of time passing through. Yet, that is where the similarity between these two groups ends in my experience. This is because the majority of the local Thai people that I have met and conversed with have not explored their country because they cannot afford to. While the international backpackers seem to be doing way too many things at once: constantly using the Internet to plan the next leg of their trip or to update their web blogs, spending tons of money on alcohol and flashy hostels, and making numerous phone calls to family and friends in order to secure a job and comfortable living arrangement upon their return home. In other words, living in the future and the past while the present goes unattended. Don’t get me wrong, I love locals and I wholeheartedly believe that traveling makes for a wonderful education. But over-romanticizing the lives of local people and undertaking to go around the world in a few months can produce something very akin to lofty ambiguousness. But I digress, and the Buddha already gave his discourse on this same topic thousands of years ago. And yet, here we all are. Image: Fotopedia, “untitled” by username: Suriya Donavanik, under the Attribution-ShareAlike 3.0 Unported license. Paul W. Jacob is the author of the spiritual memoir, Buddha Behind the Bar, to be published in the Winter of 2014. He is also the former Publishing and Editorial Director of Modern Nomad magazine and worked as a Feature Writer for the global club-culture magazine Revolution. His poems, locational essays, music journalism and travel stories have been published in literary journals, cultural magazines, and newspapers. Jacob currently teaches creative writing at select colleges in Florida and mentors youth in summer educational programs.